Bold brows have never been more popular than they are now. There’s just something about powerful, defined arches that leaves girls wanting more and more hair on their brow bone. While you can wait months and months (and possibly even years) to grow out your brows to look like Cara Delevingne’s, you can also just fake a bold, full brow. You just need to know which products to use and what techniques to apply and you’re as good as being the poster girl for delightfully full brows. Watch the video to see how brow artist Jazz Pampling completely transforms sparse brows into something almost magical. Are you trying to grow out your brows? Do you prefer full brows? Yes; I do prefer fuller brows and a great video, thanks. Wow her eyebrows look amazing! It's amazing how it can give the whole face that extra polish when the brows are perfected. I don't like this look but it would be good for people who need this. 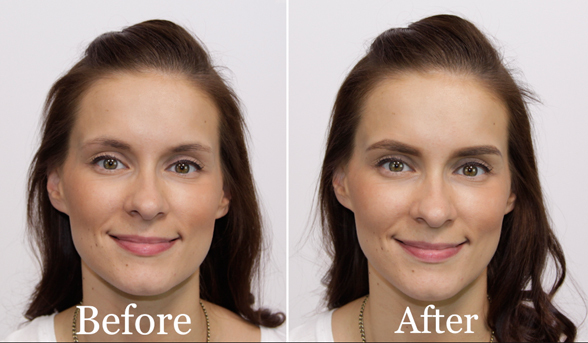 Personally, I think the brows on the 'before' shot look a lot softer, but good tutorial nonetheless. Such great advice and information on achieving how to fake and get those bolder brows! Love this. I only wish that I could do it. I think I fail miserably when I do my brows. Full eyebrows can completely transform a face. I like the eyebrow boldness created, its not over the top still looks nicely groomed. Ok I'm caving, I have to give brow shaping a go. Need to fill in my sparse brows! I like the before and after. Thumbs up. I'm a strawberry blond with fair eyebrows, but I'm not too sure about how fuller brows would look on me... Like a caterpillar on a strawberry! Didn't get to see the video .what key ?